It was wonderful to see Musicfest Vancouver include a mini-orchestra like Portland’s Pink Martini in this year’s programme. The band’s musical style is a potent mix of cosmopolitan jazz, Cuban-fusion, and even new age. 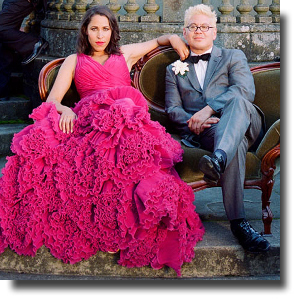 Led by their flamboyant bandleader and pianist Thomas Lauderdale and fronted by vibrant lead singer China Forbes, Pink Martini took the audience on a musical world cruise. The repertoire was certainly eclectic with genres encompassing: baião, bossa nova and Brazilian samba. Hardly waiting for her band-mates to set up with their instruments, Ms Forbes jumped right into one of their few English Language songs, Let’s Never Stop Falling in Love from their oddly titled second album, Hang on Little Tomato. Forbes continued to enthrall the audience singing in multiple languages that included Italian, French, Spanish, Portuguese, Japanese, Mandarin and Turkish (she did got some help on the Turkish lyrics with Ishq Daa from a group of Turkish-Canadians pulled out of the audience). Introducing a French language song Je ne veux pas travailler, which she penned with Lauderdale, the singer drew chuckles from the audience who obviously caught the joke about her smoking habits. In a duet that featured percussionist Tim Nishimoto, she quickly followed up with one of the band’s signature tunes, Donde estas, Yolanda? After the band brought the first set to a conclusion with Una notte a Napoli; an intoxicating dance number sung in Italian; the second set kicked off in an exotic vein with U Plavu Zoru that featured a solo by Pansy Chang on cello. However, it didn’t take long for the band in get back in a familiar groove with the ‘seventies-era’ Over the Valley and the rather tongue-in-cheek rendition of Hey Eugene. Pink Martini ended their regular programme with China Forbes and Tim Nishimoto offering up a rather bizarre homage to Barbra Streisand and Judy Garland on Forget your Troubles, Come on Get Happy. No one ever goes home from a Pink Martini concert without an encore and this show was no exception. Ms Forbes led the band in an “up-on-your-feet” performance of Brasil, a Carmen Miranda tune sung in Portuguese.